27 young scientists from different research areas from Belarus, Poland and Ukraine came together for this rather different summer school. 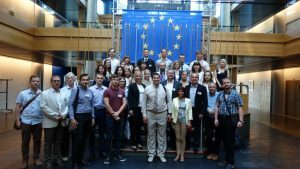 First, the participants spent two days in Strasbourg, visiting the European Parliament, the European Council and the European Court of Human Rights. Thereafter they had an intensive week in Essen learning about a broad range of topics – the different political systems and international cooperation, research ethics, participation, diversity and gender equality, etc. – all important elements of a successful scientific career. This workshop was funded by the DAAD (German Academic Exchange Service).